The Santa Barbara Wine Country section of the California Central Coast Travel Guide describes the county's vineyards and wineries including the types of wine grapes grown, scenic routes through wine country, and where to go tasting. Also included are attractions and amenities offered by the numerous pretty towns in wine country. This was the area made famous by the movie, "Sideways". Includes Santa Maria Valley, Foxen Canyon, Los Alamos, Santa Ynez Valley, Los Olivos, Buellton, Solvang, Santa Rita Hills, and Lompoc. Santa Barbara County is one of California's premier wine producing and wine grape growing regions. Renowned for its distinguished vintages, quaint settings, and hospitality, the region is home to more than 100 wineries and over 20,000 acres of planted vineyards, many of which are smaller, family owned wineries. The microclimates of the Santa Ynez and Santa Maria Valleys are uniquely suited to growing a wide variety of grapes, including Chardonnay, Syrah, and Pinot Noir. With warm, sunny days and cool evenings, these narrow valleys draw cool ocean breezes from the Pacific, a marine influence that keeps yields low and quality high. The wine country of Santa Barbara County has long played second fiddle to Northern California's Somona and Napa Valley. A 45 minute drive northwest of Santa Barbara, it was an area locals pride themselves on but few outsiders were aware of. But Alexander Payne's Oscar® winning film "Sideways" has changed all that. The Santa Barbara Conference and Visitors Bureau offers a self-guided "Sideways" tour map of the area that features 18 of the locations highlighted in the film, including restaurants and wineries. The map is free - call (805) 966-9222, or you can download "Sideways - The Map" (a PDF file) from the Bureau's website. Most wine tasting rooms are open daily, except on major holidays, from about 10 AM until about 4 or 5 PM. Many wineries have picnic areas open to the public, have scheduled tours, and some are available for group meetings, weddings, and other special events. Some wineries do not have tasting rooms or are only open on weekends, or by appointment only. Most wineries do charge a fee for tasting per person, which some refund with any wine purchase. Inquire locally with the winery's tasting room for directions, business hours, tour schedules, tasting fees, or special events. Wineries of Santa Barbara County Touring Guide. For those wishing to stay around the city of Santa Barbara, the Urban Wine Trail offers a variety of shops featuring local wines. Six shops are clustered within a few blocks walk of Stearns Wharf. This is an excellent opportunity to sample local wines if you don't have the time or inclination to drive up to Wine Country. This is the birthplace of Santa Barbara Wine Country. The first vineyards were planted on land now within the Byron vineyards. The first local wineries to make wine from Santa Barbara County grapes were Firestone and Zaca Mesa. Tour - Most of the regional wineries are along Foxen Canyon Road which roughly parallels US-101 between Santa Maria and Los Olivos. From Santa Maria, head south on US Highway 101, exit east on Betteravia Road. Turn right on Dominion to Cottonwood Canyon Vineyard & Winery which offers wine cave tours on Saturday and Sunday, weather permitting. Follow Betteravia Road east to Foxen Canyon Road. Continue heading southeast along Foxen Canyon Road to Rancho Sisquoc, Foxen 7200, Zaca Mesa Winery, Fess Parker Winery & Vineyard, Firestone/Curtis Vineyards, and others. Some wineries are on side roads. Watch for wine country directional signs along the way. You may turn onto Zaca Mesa Road to return directly to US-101. Continue south on Foxen Canyon Road to reach the Los Olivos area (east on CA-154 and south on Grand Avenue) where there are many more wineries and tasting rooms. "Sideways" tour locations include Fess Parker Winery & Vineyard ("Frass Canyon"), and Firestone Vineyard. Unlike the megabad winery, Frass Canyon, portrayed in the movie, Fess Parker Winery produces premium and award-winning wines. Fess Parker is best remembered for his portrayal of Davy Crockett and Daniel Boone in the late 1950's and 60's and was active in the operation of the winery until his passing in 2010. Santa Ynez Valley is considerably warmer than Santa Maria Valley, enabling this region to excel in growing Syrahs along with numerous other Rhone and Italian varietals. 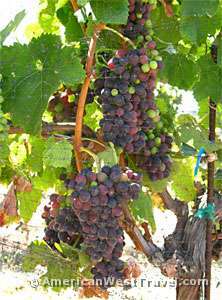 Tour - From Buellton or Solvang, take Highway 246 east, turn north - left - on Alamo Pintado Road, a very pretty country road with four wineries (Buttonwood Farm, Rideau, Lincourt and Blackjack Ranch). In a few miles the road bears right and quickly reaches a "T" intersection. Turn left on Grand Avenue to reach the village of Los Olivos. There are many tasting rooms along Grand. Turn right on Roblar Avenue to visit more wineries (Beckmen, Roblar, Brander, and Bridlewood). Grand Avenue north soon reaches CA-154 which quickly returns west to US-101. 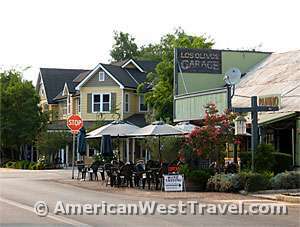 Los Olivos - Historic village noted for its inns, eclectic art galleries, wine tasting, speciality shops, and epicurean restaurants. Many wineries have tasting rooms on Grand Avenue, the main street. "Sideways" tour locations include Andrew Murray Vineyards (tasting room) and the Los Olivos Cafe. [Photo Left, the Los Olivos Garage and center of town also appeared in the movie]. Buellton - Located at the junction of US Highway 101 and Highway 246, Buellton was name after R. T. Buell, a successfull California rancher. "Sideways" tour locations include the Hitching Post II (restaurant & winery), and Ostrich Land. A famous stop in Buellton is Andersen's Pea Soup Restaurant which has been serving its iconic bottomless bowl of pea soup to millions of visitors since 1924. It has been featured on the Travel Channel. The town of Solvang bills itself as the Danish Capitol of America. Founded in 1911 by Danish immigrants, the town offers visitors an old-world Danish atmosphere in the architecture of its buildings, windmills, bakeries, restaurants, and even museums. Numerous shops in town sell goods imported from Denmark. Solvang is located in the heart of the Santa Ynez Valley surrounded by the communities of Los Olivos, Buellton, and Santa Ynez. The area offers many opportunities for wine tasting, self-guided, and guided tours. A pleasant walking tour in Solvang would include a stop at Mission Santa Ines, your choice of many wine tasting rooms and wine bars, and a variety of Danish bakeries and speciality shops. See the driving tour recommendation for Santa Ynez Valley above. Visit recommendations: You can spend a few hours or several days in Solvang and vicinity. The wine country is very bucolic and beautiful. "Sideways" tour locations include Mission Santa Ines, golf at the Alisal Guest Ranch, and the Solvang Restaurant. Established in 2001, The Santa Rita Hills is actually part of the Santa Ynez Valley, but its unique soils and climate distinguish the grapes grown there from the ones in the warmer, eastern part. The area is naturally cool and windy with more of a maritime climate than Santa Ynez Valley. It benefits from the brisk daily ocean breezes and early forming, late dissipating maritime fog which blankets the vineyards. This region is noted for its exceptional Pinot Noir and Chardonnay. Tour - There is a convenient loop tour from Buellton on US-101 west to Lompoc and then back. Take Santa Rosa Road west from Buellton to visit Mosby, Alma Rosa, Sanford, Lafond Winery and Vineyards to California Highway 1. Follow Highway 1 north a short distance to the CA-246 junction. Take Highway 246 east back to US-101 to visit Foley Estates, Babcock, and Melville Winery and Vineyards. To visit the Lompoc Wine Ghetto, take 12th Street north from the CA-1 / CA-246 junction. 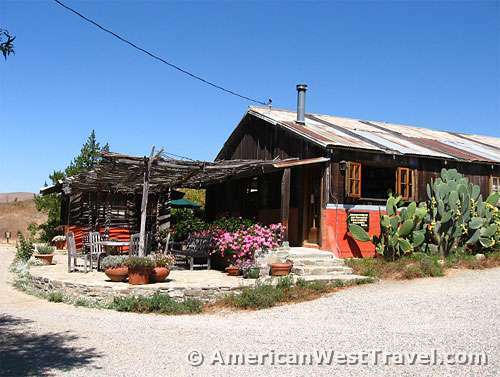 [Photo Left, the rustic tasting room on the Richard Sanford Ranch, featured in "Sideways"]. The winery is now called Alma Rosa - at the time of the movie, it was Sanford Winery (which is now a separate business with separate wines). The wine pourer, Chris Burroughs, also featured in the movie, is now the tasting room manager. At the west end of the Santa Rita Hills, Lompoc bills itself as "the City of Murals in the Valley of Flowers". The region is one of the nation's chief producers of cut flowers and flower seed. During the spring and summer, the countryside is ablaze with fields of flowers under cultivation. Every year, the Lompoc Valley Flower Festival is held in the spring. The city of 41,000 is also noted for its outdoor wall murals in the historic old town district. Lompoc has over 32 major commissioned murals painted by noted artists, as well as an additional 40 murals. The La Purisima Mission State Historic Park is also located in Lompoc. Founded in 1787, this is the eleventh of 21 Spanish Missions established in early California. 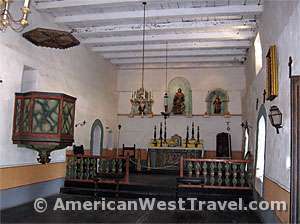 [Photo Right, the sanctuary in La Purisima Mission]. A new addtion to Santa Barbara Wine Country, the Lompoc Wine Ghetto features a collection of independent, small-production wineries. They have taken over a small industrial park in Lompoc, using it for both production and tasting room. Sampling wines from small scale or family wineries is one of the best ways to discover hidden gems. From the intersection of California Highway 1 and 246 (see Santa Rita Hills Tour), take 12th Street north and then left on Industrial Way. Lompoc Wine Trail - Wine Ghetto Map - printable PDF file. Ballard Inn and Restaurant, 2436 Baseline Ave. (Alamo Pintado Rd. ), Ballard, CA 93463 - Top-rated Californian/Continental in an intimate country setting - AAA-4-star, TripAdvisor-5-star. Andersen's Pea Soup Restaurant, 376 Ave Of The Flags, Buellton, CA 93427-9704 - Serving iconic bottomless bowl of pea soup for over 80 years. Elegant country inn in the center of Solvang California, within walking distance of amenities and attractions. 40 guest rooms/suites on 3 floors. Smoke free premises. Danish-themed. Fine dining. Full service hotel offers a health club, tennis courts, outdoor pool, spa, and a sauna. Complimentary wireless Internet access is available in public areas. Also, a restaurant, coffee shop/cafe, and bar/lounge. Guests have complimentary access to a casino shuttle. 149 guest rooms/suites on 4 floors. Smoke free premises. Free parking. Upscale bed and breakfast has a health club, spa, sauna, and a restaurant. Guests are served a complimentary breakfast. Complimentary wireless Internet access is available in public areas. Guests have complimentary access to a casino shuttle. Free parking. 20 guestrooms. Smoke free premises. More Hotels in the Santa Barbara, California Area.